I would love to get more information on how to beat back those Alligators! What happens when the Alligators are taking over? This is where the role of the Manager becomes truly important. The people who do production work (Strata I) can only work harder. The people who make sure production gets done (Supervisor, Strata II) can only organize the chaos (also known as straightening the deck chairs on the Titanic). The role of the Manager (Strata III) is to analyze what is causing things to be overwhelming and out of control. This is system work. Stop and think. What is the cause? The most useful tool I know of is a long roll of butcher paper (available at any restaurant supply store). Roll it out and tape it on the wall. Create a flow chart of the essential steps necessary to do the work that is required. We are talking circles, boxes and triangles connected by arrows, cause and effect. Step One, Two, Three and Four. Then, for each step, ask why we are doing that? Is that in line with our senior purpose? This exercise will expose unnecessary steps or activities that simply do not add value to the process. Get back to the fundamentals, do only those things that are truly essential. Draw flames around the hotspots, the burning platforms. Are instructions clear, is there a hand-off missed? This is system work. This entry was posted in Systems and tagged system work, systems on August 20, 2018 by Tom Foster. “So, your team could have worked harder, stayed longer, given it all their might and the reject rate would have stayed at ten percent?” I floated. “Why do you think they were down in the dumps?” I pressed. This entry was posted in Accountability, Systems and tagged accountabiity, manager, systems on December 2, 2015 by Tom Foster. “Busy?” I asked. For me, busy is a code word, a clue, that there is a mis-match in level of work. “Chaos?” I asked. For me, chaos is a code word, a clue, that there is a mis-match in level of work. “Then, why did you start coming to work so early?” I probed. “Because I was too busy during the day. There was too much chaos during the day. I couldn’t get anything done,” Adrian was frustrated with his circular problem. This entry was posted in Accountability, Systems, Time Management Skills, Time Span and tagged roles, systems, time management on July 24, 2015 by Tom Foster. “That which does not kill you, makes you stronger,” Jim Dunbar grinned. “Our momentum told us we were not likely to die, at least not in that fiscal year,” he said. “We were invincible. So, I signed a lease on the second plane. “Passenger loads picked up, and I had to hire more people. And that led to a predictable stumble. There was no rhyme or reason for the way we did things. We survived on our tenacity, but our tenacity began to fail us. My wife described our behavior as improvisation. Invincibility and improvisation make for a toxic cocktail. We over-promised, extended our thin resources. “I remember our first overbooking. We had more passengers than seats. I looked at my schedule, figured we could make the run to Denver, flip the aircraft around and come back for the other group. For some reason, we thought the stranded passengers would wait the four hours. But, a weather system moved in. In spite of our promises, we never made it back, and missed another flight leg with a scheduled full plane. “To say we flew by the seat of our pants was an understatement. But, at the time, I figured that my team practiced for months. We successfully flew one plane, how difficult could it be with two planes? 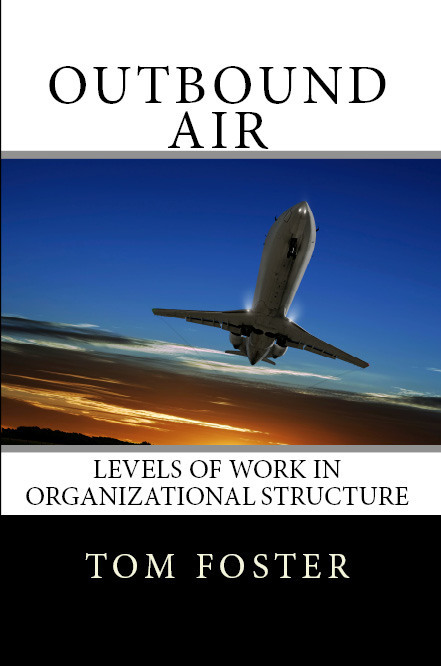 Excerpt from Outbound Air, Levels of Work in Organizational Structure, by Tom Foster, now available on Kindle, soon to be released in softcover. 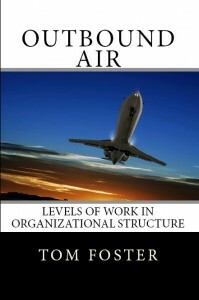 This entry was posted in Organization Structure, Systems and tagged go-go, manager, Outbound Air, systems on April 21, 2015 by Tom Foster. “What feedback do you get from the sales team? What are their reasons?” I asked. “What about the shipping department?” I pressed. “Seems like everyone is in blame-mode. The shipping department says they can’t get orders out of the production department. And the production department is blaming everything on a machine,” Abby replied. This entry was posted in Systems and tagged analysis, manager, systems on May 16, 2014 by Tom Foster. “Do you really think it’s luck?” I asked. “Yes, but there is always some variable on the project that drains the schedule, or adds cost,” Vicki pondered. “So, if you could remove the variability, anticipate the variability or at least have a well planned contingency when things don’t go right, profit might not be as affected?” I pressed. This entry was posted in Accountability, Systems and tagged accountability, problem solving, profitability, systems on September 10, 2012 by Tom Foster. “You improved your quality, so your warranty program became a competitive advantage instead of a liability. Your lead time was down to four weeks. You lowered your cost structure. Your output and unit profit was consistent and predictable, systems focus. And then the rug got pulled out?” I asked. “What do you mean?” I quizzed. This entry was posted in Strategy and tagged competition, competitors, integration, market responsive, strategy, systems on August 1, 2012 by Tom Foster.